I love memoirs, and I've been eating them up lately. I wanted to share with you guys a few titles I've really loved in the past few months. Stories of other people lives, other people who struggle with weight or depression or food, are what I love when searching for a good book. Writing style is important as well, and these all have varied and exciting rhetoric. Brittany Gibbons, author of the blog Brittany Herself, wrote an amazing and funny book about being a fabulous woman. She writes about being plus size in a humorous, accepting way, and this book has a great message for women at any age. It reminded me a lot of one of my favorite books, How to be a Woman. I loved every bit of this book, and I would recommend it to everyone. This book, by Andie Mitchell from the blog Can you Stay for Dinner, is another memoir about body image and self discover. Andie's book has a slightly separate tone, though, as she goes through a physical transformation. 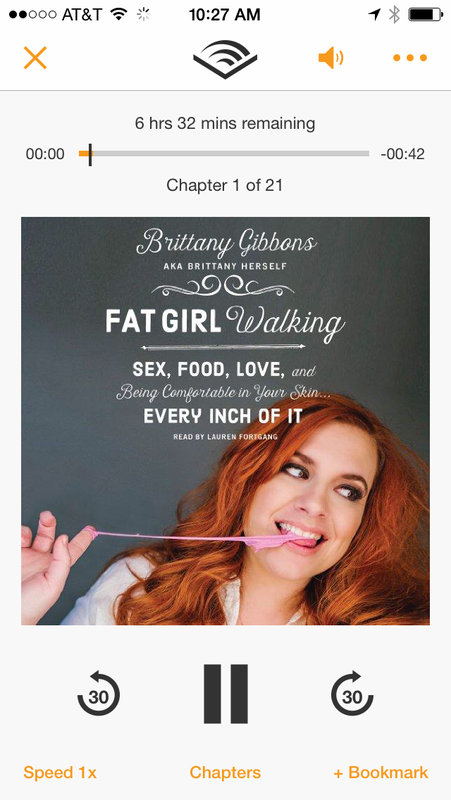 Where Brittany discovers that it's perfectly fine to love yourself as is, Andie changes her body and learns so much about herself on the journey. 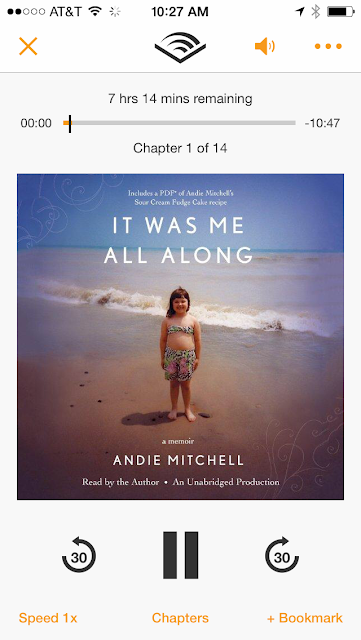 Andie's reading of the story is a little stiff, but it's still a pleasant listen. Perhaps the funniest and craziest blogger memoir I've had a chance to listen to lately is this title by Jenny Lawson of The Bloggess. This book is a hilarious tornado of crazy, and I enjoyed every minute. Some of the initial childhood shenanigans are not for the faint of heart or stomach, as her dad has a bit of a habit of stuffing animals and leaving them around the house. If you can get past that, it's a wonderful listen. 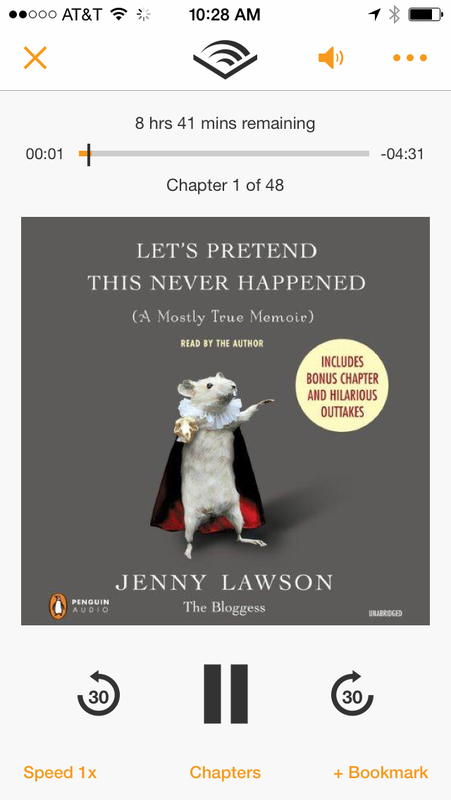 Jenny is absolutely honest about her neurosis and bad habits, and her relationship with her husband is at times sweet, horrible, and always funny. If you listen to any of the books in this post, pick up this one. 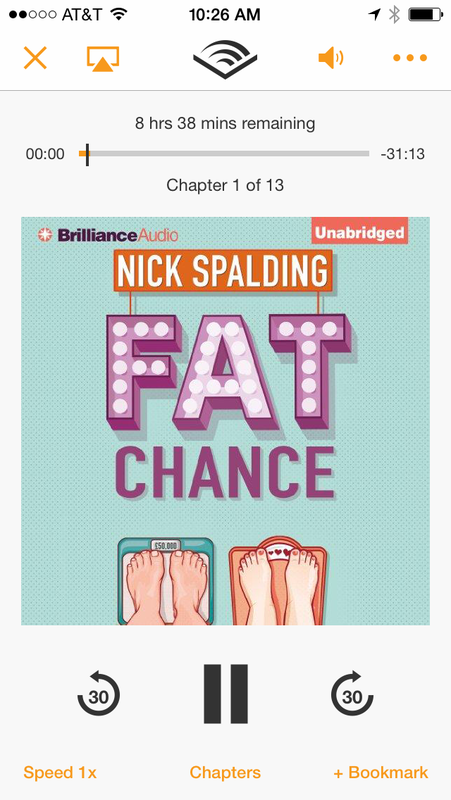 This book isn't a memoir, but it's a hilarious British read about weight. The premise is that a husband and wife have agreed to be in a weight loss competition, and the entire story is told through their journal entries. I laughed out loud, commiserated with them, and rooted for them. It was a quick and funny listen. The most serious and intense listen in this list is Blackout. 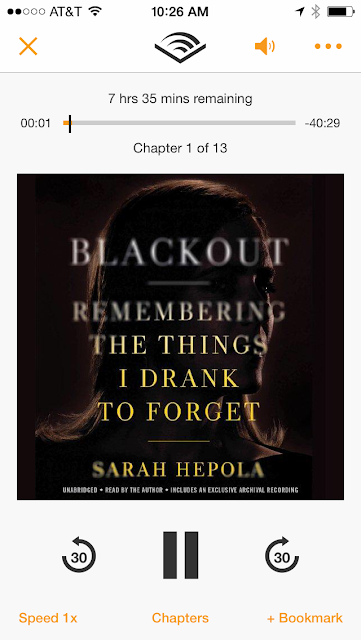 This book is about a journalist and her chronicles of binge drinking and black outs. It definitely gets intense and dark at parts, and while it attempts to be humorous, it's not always so. 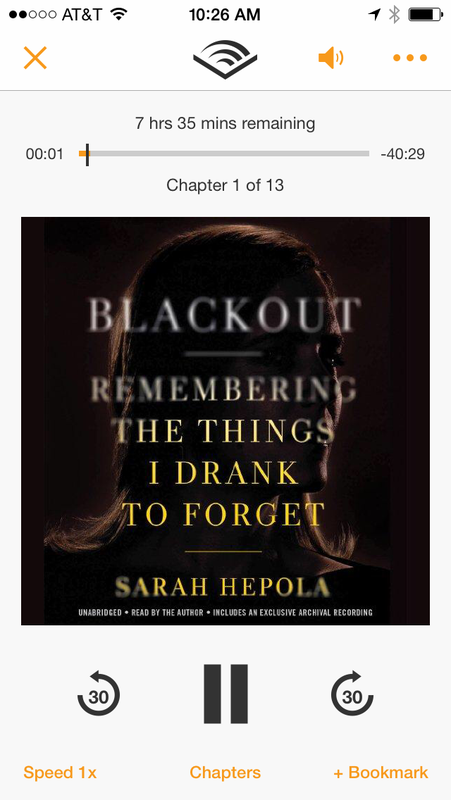 I am glad I listened to it, but it wasn't as light and uplifting as many other memoirs. What's great about this listen is how honest the author comes across, and she doesn't leave out details to make herself look good. It's gritty and real and really makes you think. So, I know it's almost the end of the summer, but if you're looking for a good listen (or read, these are also in book form), then check some of these out. Of course, I have no affiliation with any of these books or audio listening format; I just love to bring to you guys the things that make me happy in life. I will always tell you otherwise. 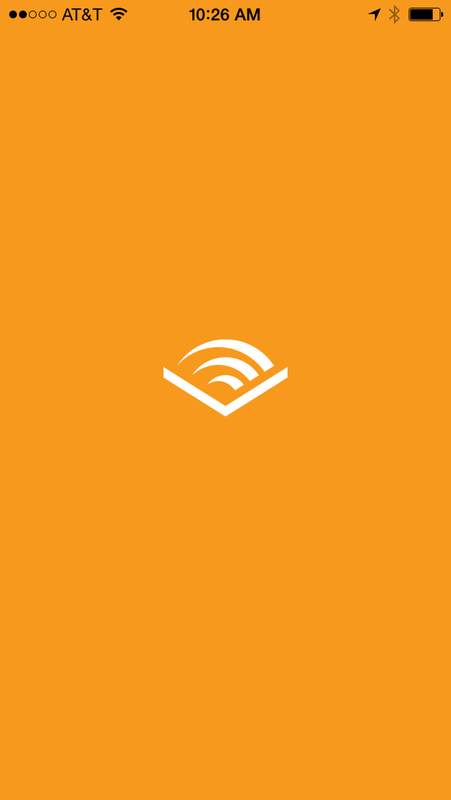 Do you like audiobooks? What are some of your favorite listens? Are you familiar with any of these titles? Leave me a comment! Thanks for the list! I love to read, and these all sound great. A few of them almost seem like they were written to be read by me. Making a list now. He never cashed it, probably because he couldn She made the check out to Turner Star. After, she asked him to dance with her in her room, to Saturday Night Fever. Weeks later, they were lovers. But if that makes you uncomfortable, Jensen says using undies with no pants is OK for potty training boys and girls, too. "We do not put pants on the child during the training process because we want to be able to see when they have an funny t shirts for women accident," she says.Speaking of Accidents. "Accidents will happen; that is part of training. Children learn from having those weed shirts accidents," says Jensen of potty training girls and boys. "The 3 Day Potty Training Method is against punishments during training.